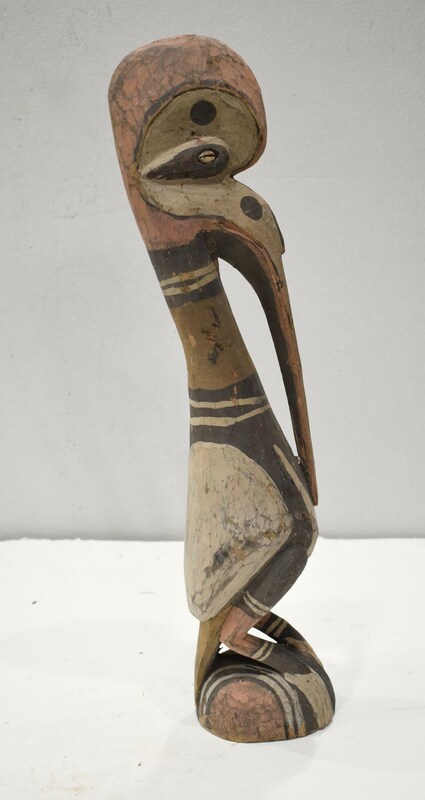 This unique Old Mythical Carved and Painted Wood Subut Bird is from the Iatmul Tribe , Yamok Village, Middle Sepik Region of Papua New Guinea. The men carve a Subut bird from their creation story. Subut is the good Spirit in the Creation Story. In the Iatmul creation myths, a bird called Subut took a leading role by protecting a woman from being raped by a crocodile-man. The woman laid two eggs which the Subut helped tend. The eggs eventually hatched, one being a human and the other being an evil crocodile-man. Since Subut helped protect the woman and her eggs, the Iatmul people view Subut as a protector of women; and thus carvings of women in the Yamok village are surrounded by Subuts. Additionally, in Iatmul tradition it is believed that the women hold the secret knowledge of the people and that the men wield the power; therefore, Subut can also be seen to be a protector of sacred knowledge. The Subut statue is carved entirely from wood and is hand-painted using traditional paints. This was collected in the field, shows age and has discoloration. A fabulous Subut Bird Statue with all the mythical stories of creation would be a wonderful addition to your home or your collection.